The blue crabs, often referred to as "blues," for sale in grocery stores and specialty shops are commonly Chesapeake or Atlantic blue crabs. These crustaceans offer a sweet, delicate meat encased in a hard shell. Eating these crabs is usually quite time consuming, requiring you to carefully pull meat from the body and claws cracked with a mallet. A 3-oz. serving of blue crab meat cooked with moist heat contains 86.7 calories. Based on a 2,000 calorie diet, this accounts for 4.3 percent of the calories you may consume each day. Most of the calories per serving come from protein -- 79.2 percent. Approximately 15 percent of the calories derive from fat. One serving of blue crab contains 1.5 g of fat, an amount that does not use up a significant portion of the fat you are allowed each day: 44 to 78 g. It does, however, comprise nearly one-third of the cholesterol you should limit yourself to daily. With 85 mg of cholesterol, carefully monitor your meal plan to ensure you do not eat other foods rich in this compound as eating too much can increase your risk of heart disease. Blue crab serves as a good source of high-quality protein. Each 3-oz. portion provides 17.2 g. Your meal plan should have 46 to 56 g of protein in it each day -- this macronutrient not only promotes the development of muscle, it serves as a food from which your body can derive energy. One serving contains 0 g of carbohydrates. Include blue crab in your eating plan and you meet your entire daily requirement of vitamin B12, making blue crab meat a good choice to keep your heart working well. Selenium features prominently as well, with 48.8 percent of the daily recommended intake per serving. Selenium provides antioxidant protections and promotes healthy thyroid function. You will also get 23.9 percent of the zinc you need each day and 27.4 percent of the copper your body requires. A serving of blue crab is naturally high in sodium, containing 237.2 mg. Eat foods low in sodium to keep your intake as low as possible. The American Heart Association recommends that all Americans consume no more than 1,500 mg per day. Take note that blue crab may have a variety of chemical contaminants, including mercury and other poisonous compounds, that can raise your risk of miscarriage, neurological damage and cancer. 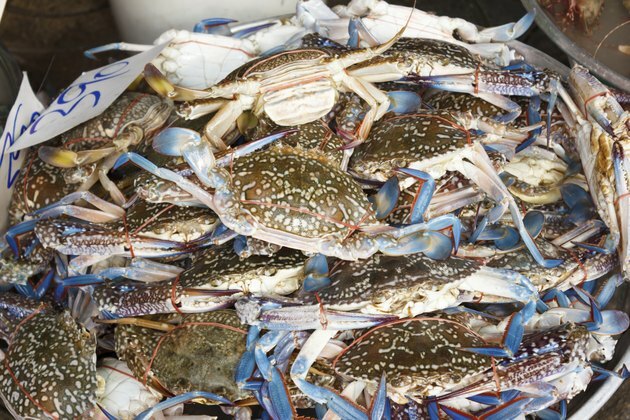 Look for blue crabs harvested in safe areas.